Pattern Description: Protruding vertical serrated zippers within concave panels cover the surface. Protruding serrated teeth run vertically, between the teeth (zippers) are concave panels. 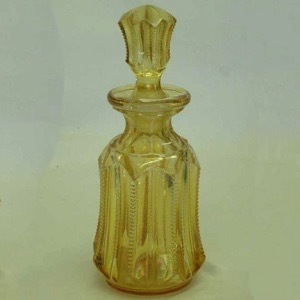 The manufacturer and date of this pattern is unknown; the iridescence is very light (probably mineral water colored) and it appears to have a very limited amount of shapes.